Back in the day when the Atari ST was the hottest music computer, German software maker Steinberg took the Atari to places no one could have imagined. Apart from inventing the sequencer Cubase, Steinberg also gave birth to an advanced audio editor called Avalon which was years ahead of its time. Even by modern standard, Avalon is truly remarkable. Avalon is at its core an audio editor capable of working with hardware sampler units both via MIDI Sample Dump and SCSI. Features included FFT analysis and effects(! ), and a virtual modular synthesizer where you could patch together your own synth sounds using oscillators, filters and effects. This on an 8 MHz computer with one megabyte of memory. You will forever be our heroes. This soundset is a celebration of Steinberg Avalon and contains all the original samples as well as all the virtual synthesizer constructions. Apart from providing the raw sounds, we’ve also used the features of Omnisphere to take the sounds to new levels. A BIG THANKS to artist/producer Torley who let us use his composition as our demo track. All sounds come from the Atari Avalon expansion. Style: Pop, Retro, Ambient, Experimental. Price: Free! Click here to download the expansion from our Freebies. 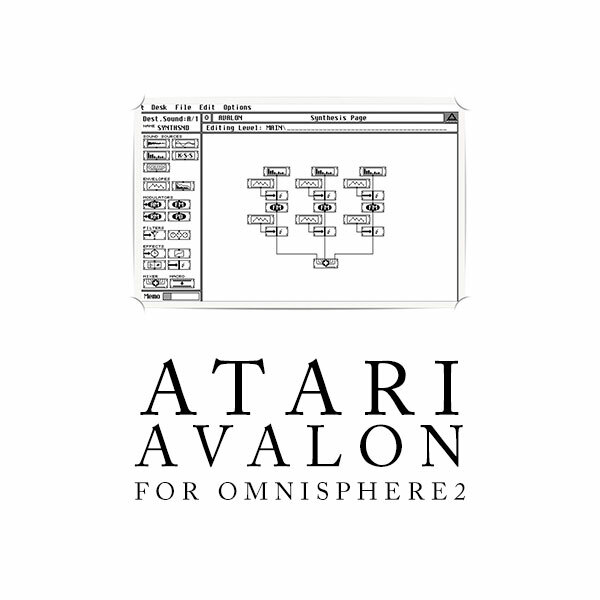 IMPORTANT - Atari Avalon is a soundset for Spectrasonics Omnisphere 2.1. This product requires a fully working copy of Omnisphere 2.1 to work. This is not a sample set.